Pete Docter’s last film was 2009’s successful and heartwarming Up, so his next Pixar film has obviously been highly anticipated. The Annecy International Animated Film Festival recently served as a platform for the director to reveal some more details about next year’s feature. As The A.V. Club previously reported, Inside Out will take place inside the mind of a pre-teen named Riley, a character inspired by Docter’s daughter. Amy Poehler, Bill Hader, and Mindy Kaling will be among those voicing the girl’s anthropomorphized emotions, around whom the film is mostly based. Docter’s presentation involved screening the first five minutes of the film, some animation tests, and concept art. The story reportedly begins with a montage—not unlike the tear-inducing beginning of Up—that introduces a baby Riley’s emotions, one by one. According to the reports, Joy is initially alone, feeling content, then Sadness shows up to stir things up, followed by Disgust (the first time Riley eats broccoli). Anger and Fear pop up later, followed by the introduction of memories. They all reside inside her brain’s Headquarters, a colorful den. Looney Tunes animators Chuck Jones and Tex Avery have been a big part of the animation team’s inspiration, causing the look of the film to be a bit different from those of Pixar’s past—and sending animation nerds through the roof with excitement. 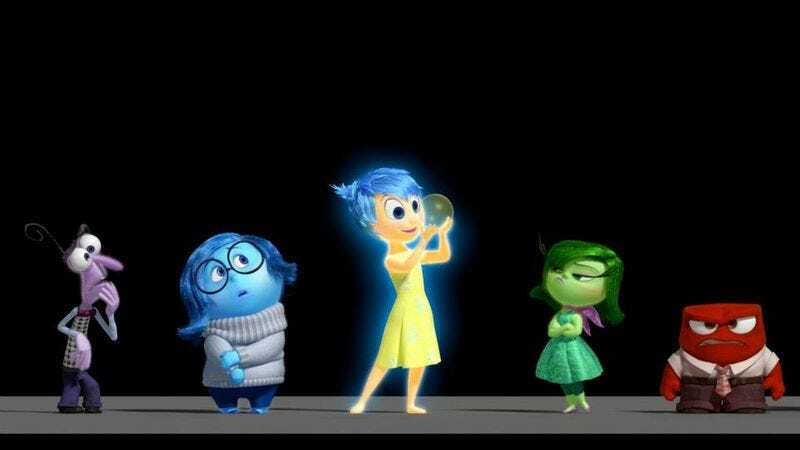 Inside Out is scheduled to be released in theaters June 19, 2015.